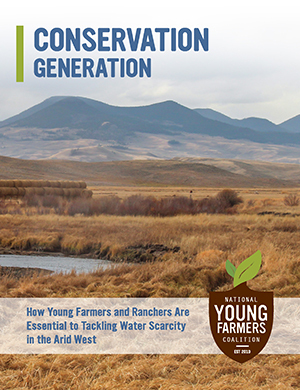 Conservation Generation: How Young Farmers And Ranchers Are Essential to Tackling Water Scarcity in the Arid West is based on a survey of 379 young farmers in the arid West as well as conversations with eight farmer focus groups. The report outlines a series of recommendations to better support young farmers that includes protecting irrigated farmland, increasing education and outreach to the young farmer community, strengthening incentives for on-farm water conservation and efficiency, and elevating soil health as an essential tool for resilience. Across most of the arid West, drought has been the norm for the last 15 years. The majority of young farmers and ranchers in this region have never farmed in non-drought conditions, which means they are uniquely focused on creative solutions to water conservation. In 2016, NYFC produced a report and a short film, both titled Conservation Generation, that paint a picture of these young farmers, their approach to water, and the challenges they face. The report is based on a survey of 379 young farmers in the arid West, as well as conversations with eight farmer focus groups. The report also outlines a series of recommendations to support young farmers, protect water, and build resilience.